Sixth grade scholars at McAuliffe are learning about South America and are engaged in a case study of Governador Valadares, Framingham’s sister city in Brazil. Scholars have identified that Framingham does not have a well documented history of Brazilian immigrants. Beginning this month, they will be starting to plan a Brazilian Museum in partnership with Rede Abr – WSRO 650 am,102.1 FM. Using resources from Kid Curator they will work to gather stories, photos, and artifacts of Brazilian immigrants which will be featured in a permanent exhibit. Rede Abr – WSRO 650 am,102.1 FM has donated an old trailer that will be refurbished to house the museum. McAuliffe is excited to be partnering with Ilma Paixao, Alex Langer, and Rede Abr – WSRO 650 am,102.1 FM, Framingham’s Brazilian Radio station on this two year collaborative project. 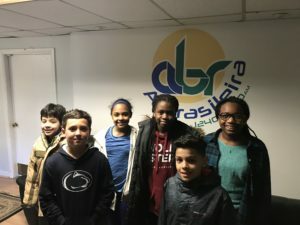 On a recent visit to the radio station, 6th grade scholars recorded a message to the Brazilian community of Framingham asking them to tell their stories. The message will be broadcast on Rede Abr – WSRO 650 am,102.1 FM in both English and Portuguese. To donate your story to our museum, send an email minhahistoria@redeabr.com. You can also call or text 774-615-6292.